Our dear friends YCN have been busy working away in Santa's workshop to bring us this beautiful array of Christmas treats. 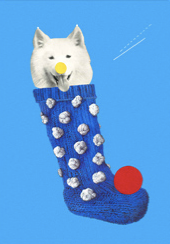 There's everything from these 'Christmas Pets' themed cards by Valero Doval to cotton covered candy canes to handmade candle holders and much much more in between. So pop along to the shop or browse online and stock up.